Brown eyes come in many different shades so let’s look at a kaleidoscope of colors to help us to enhance eye color. Colors opposite each other will be complementary so, will work to brighten each other up. For example: Red and green, orange and blue, purple and yellow. 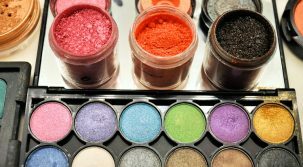 Depending on the shade of brown your eyes are will determine the shades of eye shadow you may use to brighten the brown which, may give you the effect of lightening that you are after, especially if you use colors that shimmer. If your eyes have a yellow tinge, try using an eye shadow with a purple tone. The next thing you need to consider is the one rule of makeup that will always guide you: Light colors bring out, make larger and highlight. Dark colors recede, minimize or contour. So with this in mind you could work with dark eyeliner and light eye shadow colors to emphasize your dark chocolate eyes with black liner, mascara, a smudge of pale pink eye shadow, and finish with lightly flushed cheeks and make your lips your signature. Create lip focus with a red or berry stain. To pull color focus from your eyes, giving the illusion of lighter eyes, go for a deeper shade of lip color. Dark brown eyes are very versatile when it comes to color accents, and dark brown eyes are such a beautiful feature to have, I would play them up. Compliment your brown eyes with pale pinks, or accent the brown with gold and deep rusts. Have you tried using eyeliner to add definition? One look is to use one sheer glittery eye shadow used all over in combination with a softly smudged liner for a more sophisticated look. I would definitely recommend you have a play with colored eyeliners. Dark brown eyes look stunning lined in shades of plum mix with a pale mauve shadow, aubergine mix with a shimmery light pink shadow, raisin mix with a mushroom soft brown shadow. Just remember to combine with a lighter shadow or your eyes may look more dramatic. There are various methods of using eyeliner. Pencils are the most versatile eye-defining tools, as you can start softly, blending each layer back if it starts to become too heavy looking. Pencil can be smudged softly, or add depth under an eye shadow for a muted look, or used alone for strongly defined eyes. Liquid eyeliner is much more dramatic, and can be applied over top of your eye pencil for added intensity, or used under eye shadow to enhance your eye shape. Both of these techniques ensure longwearing eyeliner. For the most natural way to line your eyes, use a small, firm brush and apply eye shadow as your eyeliner. Make the most of your dark brown eyes, using soft pinks to really bring them out. Use brown mascara for day, and a black/brown mascara for evening or special occasions. Keep eyeliner to a minimum though. Just use it to softly frame your eyes. Avoid all black as it tends to be too strong. Chocolates, deep plums and charcoals smudged into your lashes will do the trick. You might like to try adding a very subtle contour in a soft mushroom color on your brow bone just above your crease and blend this softly. On the days you feel like your eyes need a pick-me-up, jazz up your eye make-up a little. Graduating your eye makeup from at your lash line to your brow will give your eyes more depth. Use the darkest shade along your lash line, and merge into lighter shades nearer your brow. Contouring and shading can create the illusion of different eye shapes. 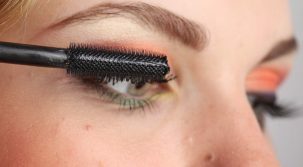 By using dark to minimize and light to make larger, you can play with altering the length and size of your eyes. ? If you just want to keep it simple, sweep a shimmery pastel shadow all over your lid, curl your lashes, apply 2 to 3 coats dark grey charcoal or dark brown mascara, and add a few individual false lashes on the outer corner of your eyes! Have fun discovering your new colors. Makeup Tips for Brown Eyes Reviewed by FashionPole on September 23, 2016 .